At a recent luncheon with fellow writers, the conversation turned to the nature of artistic temperament. We have all read articles about the connection between Genius and mental illness. We have also read and heard accounts of profoundly nasty moves made by some who are regarded as innovative, brilliant, immortal and gifted. What is the connection? The nature of mania can be what is often called a brainstorm. With all circuits firing at breakneck speed, some have harnessed this heightened awareness and let their paint brush or their typewriters or quill pens, take record some of these rapid fire thoughts. Any state or mood of increased consciousness would never yield great work in and of itself. The initial flow may be prolific and intense, but it could also be a great mess, yielding nothing of use to anyone. The ride on the back of a bucking bronco may be thrilling, but it is altogether too short. So a second talent is needed; one that allows for the discipline of picking oneself up once the inevitable crash seems to follow. Through those days, slow, painstaking effort and focus is needed to add layers and subtract all that is superfluous to produce a beautifully crafted work of art. Who lives on a street where the neighbors would discourage attendance at a potluck party in favor solitary confinement in a studio? Is the excessive sensitivity and irritability, as one definition stated, a by-product of what is required to keep the galloping herd at bay? This is what I wonder. The romantic myth of the suffering artist and its link to creativity as a kind of requirement for genius is to some extent, a bit overblown. Plenty of successful working artists and writers live a steady and rather quiet life, where family duties are wedded to productivity and acclaim. It is not necessary to have a train wreck of personal relationships, followed by an early death in a sad hotel room, to be declared a genius. It is often the perception. Part of the conflict and tension one reads about and is attributed to the artistic temperament, could also be tied to the anxiety inherent in wanting recognition, acclaim and financial security. If it constantly eludes a person who is truly original, sticks their neck out in dramatic fashion, takes huge risks and displays a lack of restraint to do so, and goes completely unrecognized in their lifetime, would not that fear and uncertainty contribute to a less compliant nature? Possibly. I saw true artistry this weekend. A horse and a figure skater put me right over the moon. 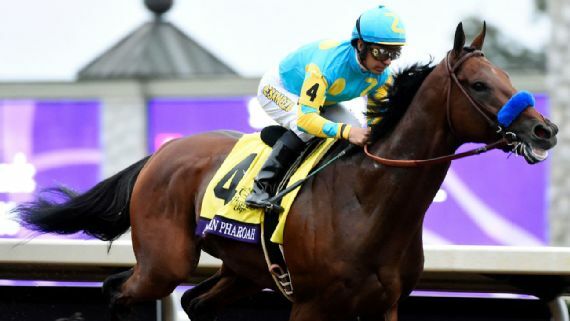 American Pharoah winning his last race in the The Breeder’s Cup, and Patrick Chan’s flawless performance in SCI showed us what devotion, hard work, and focus can accomplish. This entry was posted in Narrative Non-Fiction and tagged American Pharoah, Figure Skating, Motivation/Inspiration, Patrick Chan, Victor Espinoza on November 1, 2015 by Elizabeth Smythe Brinton.